So far, not much is known on communication issues for computations on distributed systems, where the components are weak and simultaneously the communication bandwidth is severely limited. We consider synchronous systems consisting of finite automata which communicate by sending messages while working on a shared read-only data. We consider the number of messages necessary to recognize a language as a its complexity measure. 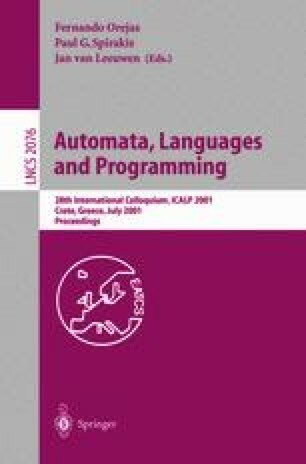 We present an interesting phenomenon that the systems described require either a constant number of messages or at least Ω((log log log n)c) of them (in the worst case) for input data of length n and some constant c. Thus, in the hierarchy of message complexity classes there is a gap between the languages requiring only O(1) messages and those that need a non-constant number of messages. We show a similar result for systems of one-way automata. In this case, there is no language that requires ω(1) and o(log n) messages (in the worst case). These results hold for any fixed number of automata in the system. The lower bound arguments presented in this paper depend very much on results concerning solving systems of diophantine equations and in- equalities. This research was partially supported by Deutsche Forschungsgemeinschaft and Komitet Badan Naukowych, grants 8 T11C 032 15, 8 T11C 012 18, and finally 7 T11C 032 20. Some of the results are contained in the Ph.D. dissertation of the first author. Some work has been done when the second author was visiting University of Mannheim.